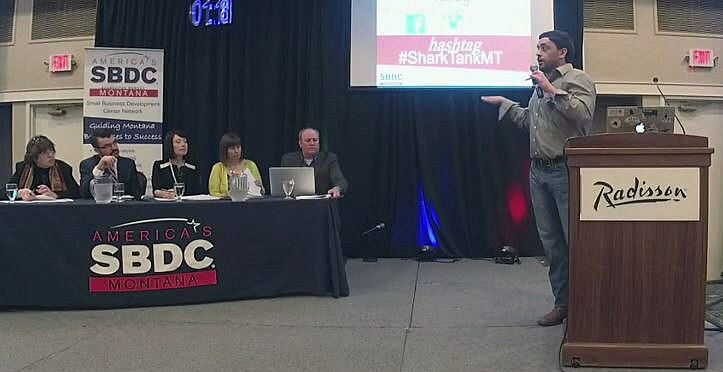 TOMIS founder and CEO Evan Tipton delivers his five-minute pitch before answering questions from the panel of judges during Tuesday’s Shark Tank competition, hosted by the Montana Small Business Development Center. An upstart Missoula software company edged out an edible cricket farm in taking top honors Tuesday in the statewide Shark Tank competition for its development of a marketing intelligence software platform designed for tour operators. 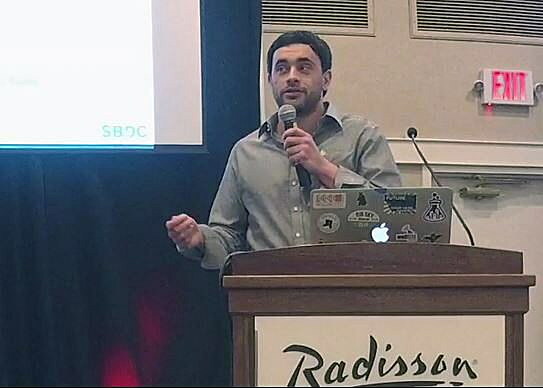 Hosted by the Montana Small Business Development Center, the competition began with a field of 15 entrepreneurs selected from a wider field of 25. Of the 15 invited to deliver their pitch on Monday, three advanced to the final round, held Tuesday in Helena. 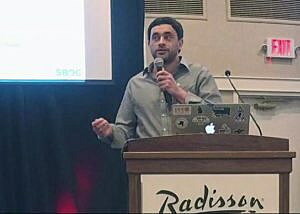 Addressing a crowd of several hundred, TOMIS founder and CEO Evan Tipton delivered his five-minute pitch before answering questions from the panel of judges. In the end, the Missoula company’s creation of new marketing software helped close the deal. While the product remains in the alpha phase of development, TOMIS already claims 25 paying customers. The beta version is expected this April. In layman’s terms, Tipton said TOMIS helps tour operators manage their marketing in the digital age using products like search engine optimization, Google AdWords, email marketing and more. While the firm’s acronym stands for the lengthy Tour Operator Marketing Intelligence Software, its user-friendly design looks to help tourism-based companies take a more strategic approach to marketing, boosting their bottom line. TOMIS is well-positioned to achieve its goals, Tipton said. The company claims former employees from Amazon, Walt Disney, Microsoft and the University of Montana. The development team has more than 68 years of coding experience, while the business team includes certified Google Analytics and Google AdWords marking reps. The company took home the $5,000 grand prize in winning the Shark Tank competition. Tipton said the firm has raised $95,000 toward the launch of its beta phase, though it’s looking to raise $200,000 overall. “Our team of 14 and growing is dedicated and driven not just in the product and customers, but also toward our state’s agenda to deliver innovative solutions at the intersection of technology and tourism,” Tipton said. Tuesday’s final round saw third place go to Easy Lift based in Great Falls. The company invented a lift for pickup trucks that moves snowmobiles, motorcycles and other heavy objects from the ground to the bed on a level platform. Second place was claimed by Cowboy Crickets – the state’s first insect farm designed for human food. Founder Kathleen Rolin said the farm currently produces 48,000 pounds of edible crickets that offer a sustainable source of protein. The farm is FDA approved and harvests its crickets at 9 to 10 weeks old. The edible insects are slowly frozen and sold to the growing consumer market.